Experience reliable electric punching for Plastic Comb Binding with GBC Modular Punch MP2000PB. Designed with user-friendly features and a stackable platform, the MP2000PB is versatile enough for any office environment. The GBC MP2000PB Modular Fixed Die Comb Binding Punch is ideal for users who are looking for an electric comb binding machine. The MP2000PB, when used in conjunction with a modular comb opener, can more than double your productivity by allowing one person to punch while another binds the documents. The MP2000PB is designed to allow you to stack your comb opener conveniently on the top and uses vertical punching to allow you to easily square up your pages when punching. Punches the GBC 19-Hole pattern for Plastic Comb binding. The ergonomic vertical punch throat speeds up productivity and prevents mispunches. Choose your preferred punching method from a palm switch or hands-free foot pedal. Auto-reverse prevents downtime due to punching too much paper. Adjustable edge guide allows for easy alignment of paper and covers. Flat top surface for stacking GBC bind stations for space savings. Bind station may be separated from the punch for increased productivity - one operator punching and one operator binding. Min Doc Size: Punches books as small as 4"
Transcript: he Modular Punch 2000 is a highly versatile punch machine that can handle all of your punching needs. Two easy to use punching controls allow users to select the best method for punching documents. Choose from a punch button or a foot pedal for hands-free punching. The level horizontal surface makes the Modular Punch 2000 so stackable that any GBC modular bind station fits neatly on top. Counter space is scarce in today's expanding office environment, with the modular series from GBC, you no longer have to worry about allocation more space than necessary to your binding systems. he Modular Punch 2000 is a highly versatile punch machine that can handle all of your punching needs. Two easy to use punching controls allow users to select the best method for punching documents. Choose from a punch button or a foot pedal for hands-free punching. The level horizontal surface makes the Modular Punch 2000 so stackable that any GBC modular bind station fits neatly on top. Counter space is scarce in today's expanding office environment, with the modular series from GBC, you no longer have to worry about allocation more space than necessary to your binding systems. When rush binding jobs occur, you have the option of separating your punch and your bind systems. One person can punch using the Modular Punch 2000 while a second person is binding with a GBC modular bind station. Separate punch and bind stations means twice the productivity. Tight deadlines for your projects require that your binding is hassle free. To prevent downtime from punching too much paper at one time, the Modular Punch 2000 offers GBC's exclusive jam stopper feature. The system begins to punch, senses a possible jam condition due to overloaded sheet capacity or extra thick material and retracts the die set from the document. At this point the operator can remove the undamaged document and separate it into smaller stacks for re-punching. Downtime due to jamming is prevented and your important document binding jobs are completed on time. Speaker 1: Is your business ready for a more reliable punching system? Your business is growing and so are your document binding needs. The system you’re using just doesn’t have what it takes to keep up with your tight deadlines and all the binding you have to do. It’s time to consider the productivity and efficiency of the Electric GBC Modular Punch 2000. With GBC’s Modular Punch 2000, you have the ability to stack the punch with the bind station so you can punch and immediately bind the document or you can separate the punch from the bind station so two people can punch and bind simultaneously for increased productivity. Stacking the two systems saves on critical office space. Document binding has never been easier or more affordable with the Modular Punch 2000. Whether you’re using plastic comb, twin-loop wire or plastic coil binding systems, you can benefit from the reliable electric punching of the GBC Modular Punch 2000. With the Modular Punch 2000, you’ll reap the benefits of simple set up, low training requirements and ease of use. The simple set up of this system makes it suitable for any office environment. An intuitive straightforward design means that even inexperienced users can easily operate the system with no special training. And the Modular Punch 2000’s quiet operation ensures binding jobs are completed with little distractions to your environment. The Modular Punch’s adjustable edge guide helps you quickly and accurately align paper in the punch throat. This ensures that finished documents are properly punched regardless of the size. Convenient alignment marks on the punching deck quickly point out correct edge guide placements for a variety of document sizes. With the Modular Punch 2000, you can punch a variety of sheet sizes, including 8 ½ inches and 11 inches as well as international A4 and A5 sizes. The open punching throat also gives you the option to punch larger sheet sizes in two steps. Adjustable selector pins allow the user to punch a variety of sheet sizes and disengage certain punch pins to prevent nicks on the edges of paper. The plastic binding version also features a depth of punch control to adjust the distance from the edge of the hole to the edge of the paper. No matter what size binding element you use, you can select the depth of punch that holds pages securely and yet also allows them to turn freely. The depth of punch control offers two positions to accommodate the full range of binding element sizes. The front loading chip tray is larger in size than most desktop punching systems. This means you can punch more paper without having to stop and empty the chip tray. Easy front access to the tray allows for quicker maintenance and less paper debris in your work area. The Modular Punch 2000 offers greater punching capacity than many systems used in the office today. The Modular Punch features a vertical punch throat, punching up to 20 sheets in plastic binding, 16 sheets in twin-loop wire or 14 sheets in the color coil pattern. Research shows that vertical punching is easier to use than horizontal punching, delivering better alignment of all sheets in the punch throat and eliminating punch skew. The Modular Punch 2000 is a highly versatile punch machine that can handle all of your punching needs. 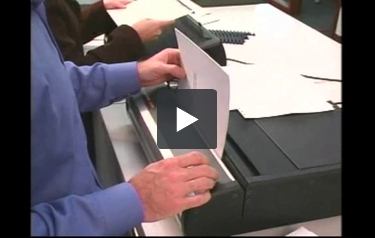 Two easy-to-use punching controls allow users to select the best method for punching documents. Choose from a punch button or a foot pedal for hands-free punching. The level horizontal surface makes the Modular Punch 2000 so stackable that any GBC Modular Bind Stations fits neatly on top. Counter space is scarce in today’s expanding office environment. With the Modular Series from GBC, you no longer have to worry about allocating more space than necessary to your binding systems. When rush binding jobs occur, you have the option of separating your punch and bind systems. One person can punch using the Modular Punch 2000, while the second person is binding with the GBC Modular Bind Station. Separate punch and bind stations means twice the productivity. Tight deadlines for your projects require that your binding is hassle-free. To prevent downtime from punching too much paper at one time, the Modular Punch 2000 offers GBC’s exclusive jam stopper feature. The system begins to punch, senses a possible jam condition due to overloaded sheet capacity or extra thick material and retracts the die sets from the document. At this point, the operator can remove the undamaged document and separate it into smaller stacks for repunching. Downtime due to jamming is prevented and your important binding jobs are completed on time. GBC knows that you expect punchers to be rugged and durable. That’s why we built the Modular Punch 2000 to last. All metal construction offers extra durability over systems made with a large number of plastic parts. The aluminum die cast base and sides of the punch help provide greater stability for those rigorous punching jobs. The dies are also staggered so that fewer pins are punching at one time, resulting in less wear and tear on the system. Paper is punched cleanly with minimal effort, giving the Modular Punch 2000 a longer life. Greater durability equates to fewer breakdowns and significantly improved reliability. In the unlikely event that a problem does occur, you can count on GBC’s network of highly trained service technicians and our industry leading factory exchange program to quickly get your machine back up and running. This means that you can depend on the Modular Punch 2000 even during crunch times when you can’t afford downtime and work stoppages. The Modular Punch 2000 was designed to ensure operator safety because GBC cares about the safety of you and your employees. GBC’s commitment to safety has led us to have our systems tested by the world’s leading safety agencies. You can rest assured the Modular Punch 2000 fully complies with UL and Canadian standard requirements as certified by CSA. The international version of the Modular Punch 2000 has full safety licensing from TUV product service and carries the CE mark as well. Speaker 2: My name is Suzy Mrdak. I work for Parksides Associates. I’m a copy and binding specialist. I receive reports in which I take them to be copied and I bind them and then I ship them to our clientele. The reason I like the 2000 PP is its open throat. The open throat feature on the 2000 PP is very simple to use. It’s just sliding your paper through, just like that, and getting a perfect punch every time. Another feature that I like about the 2000 PP is that it has a thicker lined marking for the type of paper that we might be using, and I use typically the 11 inch and the oversized cover. And it has a locking knob which I like because, when sliding in paper, it will not move. When we have small and large jobs, it’s versatile. And when I have a smaller job in which only I am handling it, I can stack the two pieces and, therefore, it takes up less space. And when I do have a larger job in which we can have two people working on it, having one punching and one binding, the fact that we can remove it and put ourselves side to side and have just one going, the more hands that we can get in there to get it done quicker, the happier our clients will be. The GBC MP2000PB is a modular fixed die punch designed to punch holes in documents that need to be bound with plastic comb binding. Unlike many of the smaller desktop binding systems that are available on the market, the MP2000PB does not include a plastic comb opener. Instead it is meant to be used with a standalone modular comb opener to help increase productivity. This machine can be used by a single operator who punches and binds each document or it can be used as part of an assembly line to increase productivity with one individual punching while another opens the combs and finishes the books. The MP2000PB is a medium duty electric binding punch that can handle up to twenty sheets of 20lb paper per lift. Although there are certainly machines available on the market that will punch more sheets of paper at a time, the MP2000PB offers exceptional punching quality and good value for its price point. This machine has dual punching controls. For users that just need to punch a few documents there is a large and easy to press button on the front of the machine. However, for high volume punching applications these machines come with a heavy duty foot pedal. The foot pedal makes punching large jobs a lot easier. However, some users prefer to use the button on the front. The MP2000PB has a vertical punching throat. This type of design can be used to help align your documents for punching. The process of dropping your pages into the punching throat can help to align your pages to reduce costly punching errors. This machine includes a stylish black case that is designed to look both professional and stylish. Many other modular binding punches look industrial, are loud and are out of place in an office environment. This machine is quiet, compact and you can even stack your finishing equipment on the top of it to conserve space. The MP2000PB features a depth of punch control to adjust how far into the paper the holes are punched. For thicker documents, it is recommended that the holes are punched deeper into the page so more of the paper is left for added strength. For thinner documents, the margin should be smaller so the paper will not overlap inside the spine of the comb. Using this machine in an assembly line fashion with one operator punching while another binds can offer almost triple the productivity of a desktop electric binding machine such as the C800pro. By allowing each operator to handle one task and eliminating the need to constantly stop punching to finish the documents the difference in productivity is amazing. Plus, the cost of this machine and a comb opener isn’t that much more than a heavy duty all in one machine. The MP2000PB does not have fully disengageable punching pins. Only nine of the twenty one punching pins can be disengaged. Using these nine disengageable dies it is possible to punch all of the most common sizes of paper. However, punching custom sized sheets may be a problem with this machine depending on the size of sheet that you need to punch. This machine has a two second punching cycle. This is the amount of time that it takes for the machine to be ready to punch another set of pages from the moment that you press the punching button. This is comparable to the punching cycle offered by the C800pro and other desktop binding systems. However, larger modular punches such as the MP2500ix and Magnapunch can have punching cycles that are up to four times faster than the MP2000PB. For high volume applications that can make a big difference. The MP2000PB is a fixed die punch and does not allow users to switch punching patterns. This machine is designed for organizations that only need to bind documents with plastic comb binding. Companies that need to produce more than one hole pattern or believe that they may want the ability to bind documents with another binding style should really look at an interchangeable die punch such as the MP2500ix. The MP2000PB is great for a medium sized organization that is looking to increase their productivity in binding documents with plastic combs or GBC Zipbind. The MP2000PB is also a great choice for companies with lighter volumes that have need for electric punching over tedious manual punching. When used with a high quality modular comb opener it can provide added productivity at a cost that is similar to many of the heavy duty electric desktop comb binding systems. However, users who need to bind documents with more than one binding style or who are looking for a high volume punching solution should probably look at a larger modular interchangeable die punching system. It is also important to remember that this system does not come with a plastic comb opener. The comb opener must be purchased separately if you want to bind documents with plastic combs. This review was written by Jeff McRitchie who is the director of marketing for Mybinding.com. Jeff has written more than three hundred articles and more than two hundred reviews on Binding Machines, Binding Supplies, Report Covers, 3-Ring Binders, Index Tabs, Laminators, Laminating Supplies, Paper Shredders and Paper Handling Equipment. The GBC MP2000PB binding machine (formerly the Ibico 620FD binding machine) is the best fixed die electric modular punches on the market. The MP2000 series of modular punches are built with the same care and quality as all of the other GBC binding equipment. Its compact design and nicely finished exterior makes it perfect for almost any office. Here are some simple directions for using the MP2000. Prior to punching your document, determine the number of holes required for the document (depends on the side of the document that is to be bound – 11” edge requires 19 holes – 8 ½” edge requires 15 holes). Deselect the Die Pins you do not want to punch by lifting the Selector Pin Lid and pulling the pins up. Set the Depth-of-Punch Lever (on the left side of the punch) to either under or over 9/16”. This refers to the diameter of the comb element being used. Plastic binding is the only bind style that uses this measure and its main purpose is to adjust the margin from the edge of the paper to the holes being punched so the element is properly filled. If the margin is punched too deep into the paper for a small element (i.e. ¼”), the pages will not open or turn easily because there is not enough room inside the element. Conversely, if the margin is punched too shallow for a large document (i.e. ½”), the pages could tear out if the document was roughly handled or dropped. Using a test lift of paper (or covers if using oversize covers), insert the sheets into the punch throat, moving them until they are flush against the edge guide and all the way into the bottom of the punch throat. Hold the sheets in place with one hand. To punch, press the punch button or foot pedal. Now, take one sheet of the punched material and fold it in half to check for hole alignment. If it is squared you’re ready to continue punching the document. When the punching is complete, remember to lift the front lid up, remove the chip tray and trash the debris. Note: As mentioned earlier, comb binding frequently uses oversize covers. This simply means the covers are manufactured 11-1/4” X 8-3/4” (instead of 11” x 8-1/2”), leaving an 1/8th inch margin at the top and bottom of the document and a ¼” excess margin on the unbound 11” side of the document. This is to prevent dog-earing of the material contained within the covers of the document. It also makes the document look neater as the pages do not stick out when the element moves in the punched holes. This does not happen with our other bind styles, the holes are smaller and there is less movement of the binding element. What this means to you, is that the edge guide must be reset to “center” the holes of the oversize cover. Follow the same steps for setting the edge guide and checking the setting that you just completed. If you were punching a number of documents using oversize covers, you would set the edge guide for the paper, punching all the paper – then set the edge guide for the covers and punch all the covers. Both wire binding and coil binding are set up using steps 1 through 5 – since the covers are flush cut with the paper (no oversize), there is no need to reset the edge guide.